Why You Need To Visit The Amazing City Of Málaga - GoTimeshare! Within the autonomous community of Andalusia along the southern coast of Spain, is located the amazing province of Málaga. Spain as a whole consistently ranks within the top ten countries in the world for visitor numbers, due to a variety of reasons. If people are asked to picture what makes the southern coast particularly special though, many would no doubt mention the abundance of sun, sand and sea. These are certainly very valid reasons, with the world famous Costa del Sol region which literally translates to “Coast of the Sun” or “Sun Coast”, being located along the south of the Málaga province. With as many as 320 days of sunshine per year, an abundance of beautiful sandy beaches, picturesque coastal towns and villages, and a fantastic selection of resorts and hotels, this world famous region is the perfect place to get away and soak up some warming rays, whichever month you choose to go. What this area is perhaps not as well known for is its culture and traditions, natural beauty, fascinating history, architecture and unique experiences. In fact, it will probably surprise many to hear that the province of Málaga is so much more than a place to go for a week or two spent lounging by the pool or at the beach. One such example of this is the city of Málaga which should definitely be on any travel itinerary if you are staying in this area. It is also a brilliant place to stay for a few nights or more, if you wanted to add on a city break to a stay at one of the excellent resorts dotted along the Costa del Sol. Málaga has an incredible history spanning about 2,800 years, meaning it is one of the oldest cities in the world! As you wander around the city’s historical centre you may quite literally feel like you are exploring a giant open museum, as you will notice archaeological remains and architectural monuments from the Phoenician, Roman, Arabic and Christian eras of the city’s past. One of the many features about the city is the buzz and vibrancy you will feel as you stroll around its multitude of picturesque streets. This is a feeling you will generally only find in a large city which it certainly is, being the second most populous of Andalusia, the sixth-largest of Spain with a population of around 570,000 and the southernmost largest city in Europe. While this is certainly a large population, it is nowhere near as big as those of more famous and crowded cities such as Barcelona, Madrid, Rome, Paris or London. Instead it offers the perfect combination of plenty of life and things to do, contrasted with the more laid-back vibe that you will have come to expect in southern Spain. While the city is certainly very economically important, being the fourth-ranking city in economic activity in Spain, it doesn’t have that stressful and impatient feel that you might have experienced in other large cities. Generally you will find the local population very friendly and helpful in shops, restaurants, bars, cafes, hotels and the various things to do such as museums. Another great thing about the size of Málaga is that you can easily stroll around the main centre, taking in many of the most important areas without having to get around buses, underground trains or taxis, as it is all completely manageable by foot. Much of the centre of the city, such as the main shopping streets have been almost completely pedestrianised, a trend that is gaining in popularity throughout increasing numbers of cities across Europe and for good reason. It makes a real difference when you are sitting outside enjoying a meal or drinks with friends or family, or wandering around taking in the many attractions of the city if you don’t have to deal with the noise of cars and having to breath in smog filled air. Around the city there is an abundance of excellent bars, cafes and restaurants with outdoor dining highly popular, as is the case in much of Southern Europe. The weather lends itself perfectly to this, as you can sit outside soaking up the sun’s rays while enjoying a café con leche (white coffee), caña (small beer) or copa de vino (glass of wine) with some tapas. While Málaga is a large city, you will be pleasantly surprised by the prices of food and drink, with the possibility of enjoying a decent meal including a drink for around 10 – 15 euros in many different bars and restaurants, in stark contrast to some other European cities. While Spain was one of the countries especially hit hardest by the economic crash of a decade ago, the country is really starting to find its feet again, with a real resurgence in fortunes, driven to a large extent by the huge popularity of tourism. 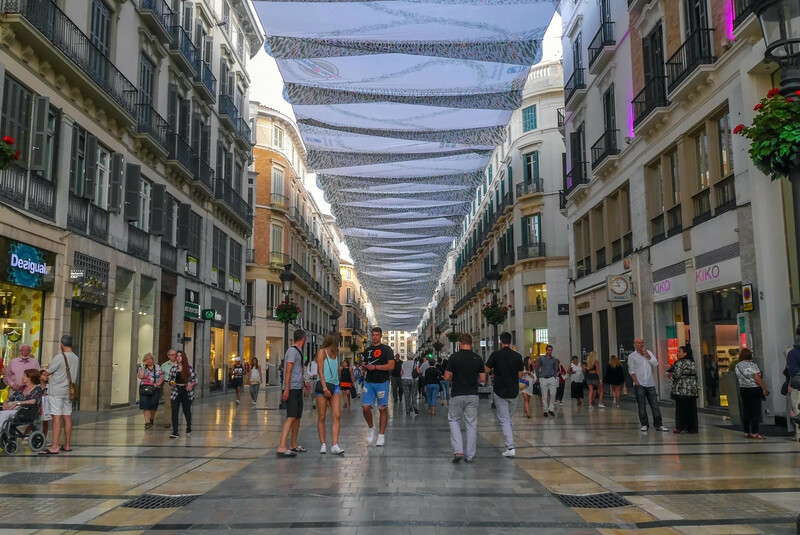 You will easily notice this in Málaga city, with new construction and reconstruction happening, clean and well maintained buildings, streets and plazas and a selection of new shops, cafes and restaurants that seem to have sprung up in the previous couple of years. Overall there appears to be a real sense of optimism and good fortune in the city which translates to generally excellent service for visitors and happy locals! Overall, Málaga is a fantastic city to visit with some fascinating historical buildings and architecture such as the cathedral, the Alcazaba, a Moorish palatial fortification built in the early 11th century which is the best preserved in Spain, and the adjacent remnants of a Roman theatre dating back to the 1st century BC. It is also full of cultural events to experience like the many fiestas that happen throughout much of the year, traditions that are very specific to southern Spain such as Flamenco which is uniquely Andalucian and dates back to 1774. In Málaga you will be able to find a number of places to watch live Flamenco shows which you should definitely experience if you are there, as it is brimming with energy, emotion and skill. The city is full of excellent cafes, bars and restaurants where you will find people enjoying meals with their friends, families and colleagues from the morning, right through to the nighttime. In fact, Málaga is equally as lively and exciting in the night as in the daytime, with many places staying open until well past midnight. With this city, there really is something for everyone, whether it is discovering history and traditions, shopping until you drop, enjoying delicious food and drink or simply taking a stroll along the gorgeous beachside promenade or next to the modern port of Málaga. Whatever you do, especially if you are staying in southern Spain, don’t miss out on this amazing city! If you are looking for a great place to stay on your next holiday in the Costa del Sol, then you will be pleased to see that you are spoilt for choice with a selection of excellent accomodation perfect for families or couples, set in fantastic locations for exploring this amazing part of Spain, including the wonderful Málaga city.